The NWDA challenge is a competition consisting of an obedience phase and a protection phase. All dogs shall wear either a fur saver or choke chain with leash attached to the dead ring. All leashes and collars must be inspected and deemed suitable by a NWDA official prior to beginning this trial. The dog must be under control, heeling at the handler’s side, from the time the dog enters the trial field and approaches the judge to check-in for the Challenge. From the basic position handler gives a "heel" command. Handler and dog walk straight ahead a minimum of 40 paces (without stopping) execute an about turn and continue back a minimum of 10 paces at a normal pace. Then, without stopping, handler changes pace, first fast for a minimum of 10 paces followed by a minimum of 10 paces slow, with no normal paces in between. Dog and handler then proceed at normal pace for 10 paces and execute a right turn, followed by 10 paces then another right turn, followed by 10 paces and an about turn (left) after which the handler halts. Dog shall automatically sit at all halts, while remaining at handlers left, its shoulder even with the handler’s knee. At this time the handler shall remove leash, and the leash shall remain off for all remaining exercises in the Challenge. From the basic position, handler gives a heel command; dog and handler then proceed at a normal speed 10 paces and then execute left turn, followed by 10 paces then another left turn. Then, without stopping, the handler walks straight ahead 40 paces, then executes an about turn and continues back a minimum of 10 paces at normal pace. Then without stopping, handler changes pace, first fast for a minimum of 10 paces followed by a minimum of 10 paces slow, with no normal paces in between. Dog and handler then proceed at normal pace for 10 paces and execute a left turn after which handler halts. Dog shall automatically sit at all halts, while remaining at handler’s left side, its shoulder even with handler’s knee. At judge's order, handler heels forward and walks through a group of no less than 4 people, halting in the middle of group. Members will be asked to calmly move in and crowd the dog while dog and handler maintain the basic position. At judge's discretion handler may be asked to heel in a figure 8 pattern around the group. Judge will then dismiss the group. From the starting point, with the dog in the basic position, the handler walks straight ahead, dog heeling, a minimum of 10 paces and gives a "sit" command, and without stopping, changing pace or looking back, continues forward another 30 paces, halts and turns to face the dog. At judge's order handler returns to dog, resumes basic position and returns with the dog to where the exercise began. From the starting point, with the dog in the basic position, the handler walks straight ahead, dog heeling, a minimum of 10 paces, handler gives a "down" command, and without stopping, changing pace or looking back, continues without stopping for another 30 paces, stops and turns facing the dog. At judge's signal handler recalls dog. 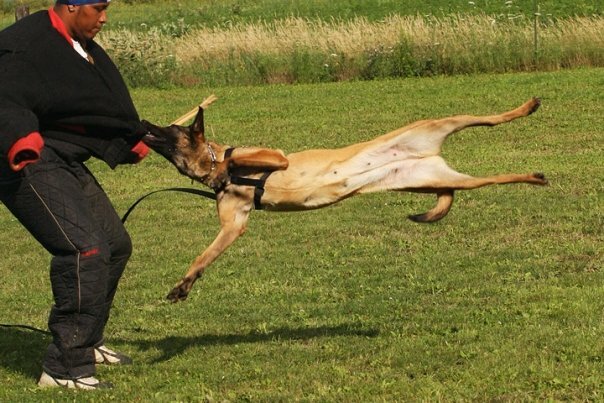 Dog should run to handler, sit directly in front and pause before returning to heel position. At judge's direction handler will be asked to heel the dog to a designated area where the dog will be put on a long down. Handler will then be directed out of sight of the downed dog for a min. of 60 seconds. Upon completion handler will return to the dog and heel back to the starting point. From a pre-determined starting point, the handler and dog will heel toward a pre-determined blind on the field. When the team reaches a point approximately 12 feet from the blind, the judge will instruct decoy/helper number one to come out of the blind and attack the handler. The dog should immediately engage decoy/helper and must continue to grip while being driven. During the decoy's drive, dog will receive 2 firm hits with a clatter stick. After the decoy/helper locks up, the dog will then be outed and will be commanded to guard and then picked up by handler. The handler and dog will then heel to a pre-determined spot on the field where they will be confronted by a second decoy/helper. The decoy/helper will run a distance of no less than 30 yards away from team. After turning back toward the team, the dog will be commanded by the handler to engage decoy/helper at judge's signal. The dog should not move until commanded to engage. The decoy/helper will fire one shot at twelve yards, another at seven yards and then two shots after the dog commits to the bite. The dog must continue to grip while being driven by the decoy for a short distance. After the decoy/helper locks up, the dog will then be outed and will be commanded to guard and then picked up by handler. At this point the Challenge is completed and the handler and dog will heel to a pre-determined spot to meet the judge, at which time the handler will put the dog back on the leash. The judge will then give the critique for the Challenge and afterward dismiss the handler and dog from the field. Handler help will result in minor point deductions for each occurrence and includes: leash corrections, tight leash, repeated commands, inappropriate change of heeling pace or body posture, touching the dog. partial points will be awarded for the exercise. The following behaviors, displayed during any test exercise will result in zero points for that exercise: aggression toward anyone other than the Helper used in the exercise, refusing to engage the Helper, refusing to out after three commands have been given. Major point deductions will occur for each occurrence of the following: a dog that misses a grip but does engage the Helper, a dog that comes off the grip but then re-grips the Helper, a dog that chooses to leave the Helper during a guard.